Nourishing the World with Gratefulness: Our Do-Good Dozen Winner, Café Gratitude Founder Terces Engelhart | Yellow Co. If you’re on our email list (which you can always hop on here), you might have seen that we recently announced a new speaker for our 6th annual conference this summer. Terces Engelhart, our Do-Good Dozen winner this month, is also a #Yellow2019 speaker because we just can’t get enough of her bright light! Before it was trendy and scientifically-backed, Terces knew the power of gratitude and founded the delicious, popular plant-based restaurants Café Gratitude and Gracias Madre. When I think of Terces, the word nourish comes to mind – not only because of the organic food she and her husband grow on their 21 acre home, Be Love Farm, but because she nourishes hearts by teaching workshops and writing books (Sacred Commerce is on my reading list!). Terces shows us there’s no better time than the present to step into who we were made to be. Read our interview with her below! What in your life has brought you to the work that you’re doing today? What does a day in the life of Terces look like? It’s really the whole journey, although I wouldn’t have known it until looking back. Everything, the challenges and the opportunities, played a part in where I am today. I start my day with milking cows and making cheese when we are on the farm. I am a bread baker, and care for the young animals and feed the crew here. My primary role in our business is supporting our team by being available for coaching, cultural trainings, decision making, and paying attention to what our people need. I’m always learning. I’m also writing a book, so I set aside time for that as well. I’m a grandmother to soon-to-be 13 little (and not so little) ones, so I love spending time with them. I teach at my local church’s leadership school and enjoy helping others see the value of gratitude. Finally, my husband and I have tea around 4pm. I’d say the one I most face now is that I “should be retiring”. At 69, I still feel committed to doing all I can to empower the upcoming generations to lead powerfully and with love. I have also always listened to my inner guidance in making choices and stepping out in faith, not always knowing what the next step would be or even where it was all leading. I am still doing that as we continually create “what’s next”. How did you come up with the idea for all of your dishes at Café Gratitude to be named as affirmations? We simply wanted to create every possible opportunity to communicate something meaningful and inspiring to both our employees and customers. There can be so much negative and degrading conversation with both others and ourselves, so we wanted to change that conversation. With great growth and success often comes many public opinions and sometimes harsh criticism. How do you navigate those conflicts and stay grounded in your mission? For us it has always been important that we are who we say we are, that way when criticism comes, we either see it as input to grow, or someone’s opinion, which may or may not have value. Can you share the story behind your first name? My birth name is Marsha, and I never minded my name. However I was sexually abused at 16 years old and kept it a secret for 20 years and struggled with an eating disorder. At 36-years-old when I started to recover, I was guided by my inner guidance (whom I call God) to turn the secret around and change my name to Terces, which is secret spelled backwards. It was one of the most difficult things for me to do; I wasn’t a hippie, I didn’t know anyone who had changed their name. However it turned out to be one of the most powerful things I could have done. I’ve been Terces for 33 years now and nearly everyday someone asks me about my name which gives me the opportunity to share. Transparency is a valuable part of my journey after being secretive for so many years. “What you can’t share possesses you,” I say. What are three essentials that help you be your best self ? Ask myself what would love do now. Look for opportunities to serve others. What’s one of the most important lessons you’ve learned as an entrepreneur? Stick with it. Do whatever it takes in the beginning to keep your dream or vision alive. Empower others. 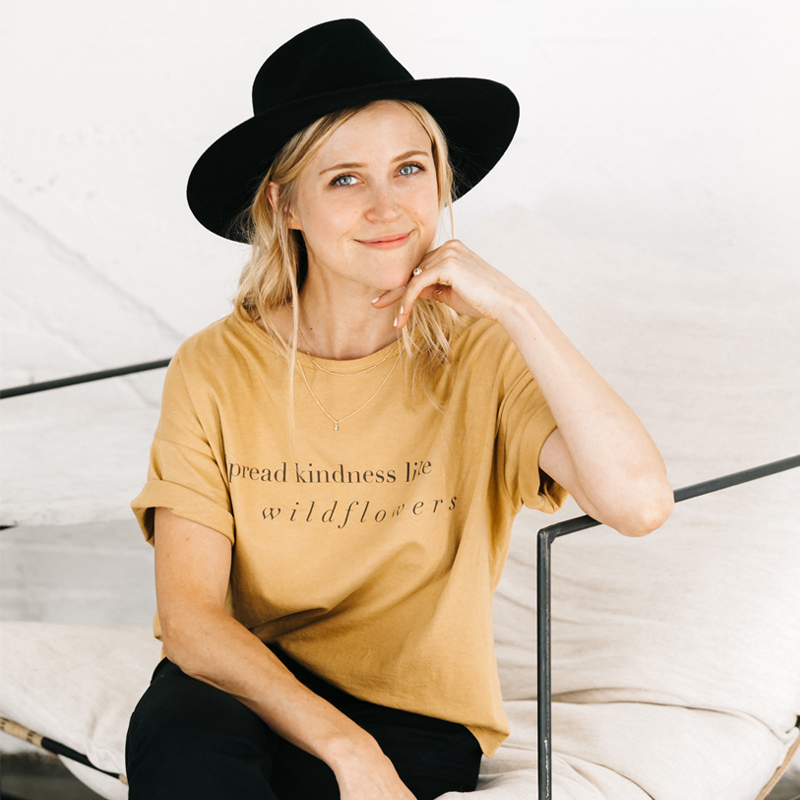 I appreciate the commitment of Vintner’s Daughter, the passion of Organifi, and I love what my friend Chrissy Helmer is doing in her podcasts and store Eco Chic here in town. You host Eternal Presence workshops with your husband, Matthew, on a variety of focuses – what is one consistent practice that you always include in each, regardless of the theme? Our work is about teaching people tools for staying present. Consider that is actually where all the goodies in life are – love, kindness, generosity… We practice something we call “clearing” in all our workshops. Clearing is a simple and profound practice of simply being with another person, asking them a couple questions, and really listening to what they say without fixing, coaching, changing, or adding ANYTHING. It is a way to clear out what might be interfering with someone being present, then allows them to share from their current experience and finally acknowledging them, which calls into existence a way of being to step into (creating a future). What are you most excited about for what you have planned for the future of Café Gratitude and Be Love Farm?